Computer Tannoy bleeps: V.SAXTON to room 3. Room 3. V. Saxton gently knocks on the door of room 3 - because this is polite. Even though V.Saxton has, effectively, been invited in she still wants to check the GP is ready for her. V.Saxton: (beaming smile, outstretching hand ready for vigorous hand shake!) Hello, hello! How are you today? I'm fine! Unfortunately, I always seem to go into 'interview - get a job' mode when I see any Doctor. I don't know why. I beam, sit up straight, talk clearly and feel like I must give the best impression. It was only about a year ago I realised this really had to stop. I looked over some old notes from a pain specialist who wrote that I seemed happy and to show no anger at my condition. Well, that wouldn't be British would it? My stiff upper lip manner meant, however, this particular pain specialist didn't take my pain seriously. I fear I was brought up too well. 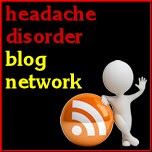 The whole point of this blog has been to try to break the taboo of talking about migraine. 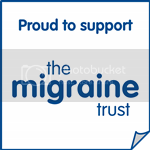 I want to encourage conversation, to dispel the myths and misconceptions that surround migraine. Because of this blog I frequently get asked about my migraines and migraines in general. This is brilliant. This is the point of the blog. I will happily chat to anyone about migraines for hours on end. Sometimes I just don't want to talk about it, and not just when I'm at the GP's. I feel migrained-out. Sometimes I just want to say "I'm fine, thanks. How are you? Did you see 'Home&Away' yesterday?" I know this completely contradicts most of the posts I've written here. I've written about the burden of living with an invisible illness that no one but your Mum knows about. But sometimes I simply want to talk about Miley Cyrus Twerking and if the new Sandra Bullock space film is any good. I don't want to have a deep and meaningful conversation about health, mine or anyone else's. This past weekend Mum had a drinks party. Her friends have been incredibly supportive. They frequently ring to check on us, send articles and genuinely seem invested in how I'm progressing. But I didn't have the energy to answer all of their (well meaning) queries. "How are you, really? You can tell me." I feel awful because they do care and have been so kind. And it is so lovely when people do actually ask. I've often been incredibly hurt when I've seen friends and they don't seem to care. But I was feeling well (i.e no headache in sight) at the party and didn't want to think, or dwell, on migraines. I wanted to be normal, I guess. My Dad has the same problem. He'll just have recovered from a bout of Pneumonia, when a friend will call to ask how he's doing and he'll reply "I'm fine, thanks. How are you?" End of story. Move on. I can hear myself sounding like a whinging brat. I want to pick and chose when I talk about migraines. I can't expect to write this blog and not be asked about migraines. It's a kind of selfish catch 22, maybe? I'm not even sure what I'm trying to articulate (as you can probably tell from this jumble of a post). My answer at the party was: "I'm on an upward trajectory, thank you so much for asking". Is this rude? I hope it's not. I want to acknowledge that I'm grateful you asked but today, for whatever reason, I don't want to talk about it. Migraine can be such a conversation killer that, occasionally, it's easier not to open that can of worms. Even though I do think we should all talk more about migraines so friends, family and co-workers understand what we go through. I clearly should not be so polite/restrained/weird when I'm at the Doctors. We should all talk about migraine all the time - except when I don't want to. Thank you so much for writing this, and in the process making me (and many others, I'm sure) feel a little more sane. I, too, struggle with the compulsion to "put a happy face" on my pain, and I also feel hurt when people don't ask how I am. But sometimes, I just need a break. I want to forget (or, more accurately, ignore) my pain, to experience some semblance of normalcy, if only for a few hours, for the sake of my mental health. When someone well-meaning asks how I am in a situation like this, I try to both acknowledge that (since it's a behavior I want to encourage) and gently redirect. Something like, "Hey, thanks so much for asking. I really appreciate it. I've been struggling, but right now I am just happy to be here. Sometimes I just need to feel somewhat normal, you know?" I'm by no means perfect at it, and I still feel some guilt about it, but it seems to get pretty a pretty good response. I just found your blog through a Pinterest pin. This is the first post I've read and, my gods, I know what you mean! Bad part of saying "I'm fine, thank you" is that people really think you are fine and can do anything. Meh.